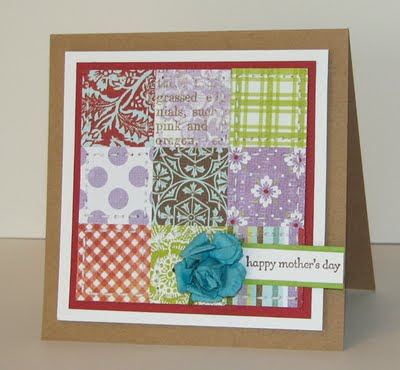 Scrapping Mommy: Happy Mother's Day!! I would like to wish all you moms, grandmothers, soon-to-be moms, and *bonus moms (I like this better than step mom) out there a Happy Mother's Day!! I have been all of the above at one point or another on Mother's Day. For today, I would like to share this card with you that I created with the May Bigger Than A Breadbox kit from Apron Strings Designs. This card has a wonderful sample of the papers available in the kit. The papers on this card are from Lily Bee Design. I cut the squares at 1 1/4 inches with my Cricut and George and then adhere them to a base. I then hand stitched each square with some white crochet thread. I added the flower (also comes in the May kit) and the sentiement (Stampin' Up!). I am entering this card into My Pink Stamper's Challenge #4. I hope that you all have a fabulous day!! I am off to church and then I am going to spend the rest of the day playing/snuggling with my kids. I am just now going thru my emails after being away for the weekend and then work today! I love the quilt look card. I just made my 1st quilt for my neice's 1st baby. TFS! !